Frequently asked questions | Alzheimer Society of B.C. Tele-workshops are one-hour educational presentations offered by the Alzheimer Society of B.C. via telephone and/or the Internet (webinar). Participants on the Internet also have the option of downloading handouts after the session. Participants with no Internet access can have these handouts mailed to them by phoning our office at 1-800-667-3742 (604-681-6530 in the Lower Mainland). How can family caregivers benefit from tele-workshops? Support for caregivers is vital to the health of families impacted by dementia. Our tele-workshops cover topics directly related to caring for people with dementia, and give family caregivers strategies to help them deal with the challenges of living with dementia. How does a tele-workshop work? A tele-workshop provides participants with information on a specific topic related to dementia via the Internet and/or the telephone. Alzheimer Society of B.C. staff or guest speakers present the information. At the end of the tele-workshop there is an opportunity to ask questions through the phone or the chat box. How do I participate in a tele-workshop? Call the toll-free line and listen to the tele-workshop on your phone or use the speakers on your computer or portable device if you have Internet access. No pre-registration is required. The following instructions are the same for all tele-workshops. Who are the tele-workshop facilitators? The tele-workshops are most often developed and facilitated by Alzheimer Society of B.C. staff. Occasionally there will be a guest speaker. Learn more about the facilitators. Additional questions about our tele-workshops? 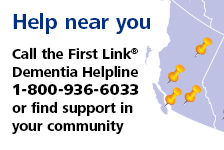 Call 1-800-667-3742 (604-681-6530 in the Lower Mainland) or e-mail teleworkshop@alzheimerbc.org.